From the past our people have inherited various musical instruments which are of interest for their craftsmanship, their originality, the way they are used and the tones they express. The knowledge and study of these instruments are of special significance to our national art and culture for, through them, we delve deeper into the quality of our folk music and the peculiarities of the musical talent of our people. Now and then we hear the tones emitted by these instruments in every village or town quarter. Without them no social entertainment takes place. Taking them in the order of the four main scientifically established genres, we have in the first place those of the idiophonic genre like (1) the two pebbles hit together in order to lure the swarm of bees which have abandoned their original hive, (2) ‘rrakataket’ which children make out of corn blades cut lengthwise, (3) ‘rrekezat’ made of twigs plaited together in a spherical shape with round pieces of wood or pebbles inside used to entertain small children when the device is shaken, (4) ‘gergerat’ made of a tapered wooden axis ending with an elastic square which bounces making a noise when turned around (5) the metallic tray which is used in northern and north-eastern parts of Albania to accompany songs and dances, (6) three dish spoons which are used to keep time, (7) ‘çaparet’ in the form of metallic discs tied to the fingers of dancers used in Central Albania to keep time by jingling them when dancing, (8) bells or gongs of various shapes, sizes and names used for ritual, practical or aesthetic purposes, (9) ‘trokeza’ or ‘çanga’ made of a board or metallic plate hanging down on a rope and used as a means of signalling, (10) ‘cungrana’ of the Albanian settlers in Italy pierced by a metallic rod in the form of a horseshoe which vibrates and emits sound when touched by the fingers. From the membraphonic genre we have: (a) the tambourine, a shallow drum with loose metallic discs at the sides, (b) the drum or tympanic membrane, consisting of a hollow cylinder with a skin head stretched over each end, (c) the ‘kadum’ or ‘tullumbas’ in the shape of a half-cylindrical cup with a skin stretched over its ends, (d) ‘tarabuku’ in the shape of a jar with a skin stretched over its head. All four of the above instruments serve to stress the rhythm. Of the aerophonic genre we have, first of all, some made from plants like the ‘picanga’, which children make out of grass blades, corn stalks, of apricot seeds (‘frysa’) or of the bark of young twigs (‘gezhoja’ or ‘bilbil’). 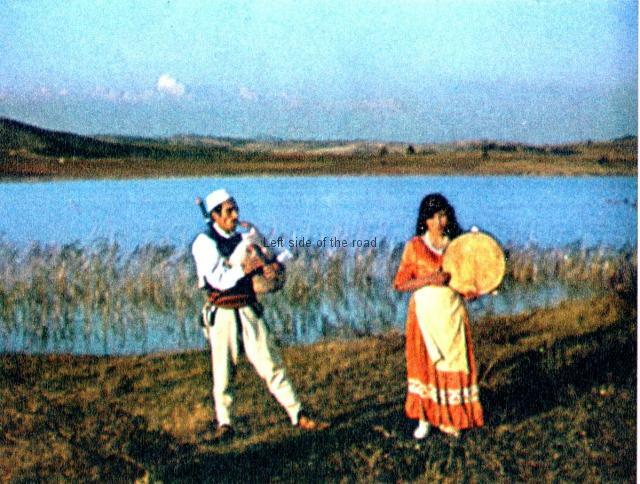 These plant based instruments such as ‘lugefyllka’,’shtambushka’, ‘tuza’ and ‘kallami me leter’ are temporary entertainments producing some tune or other. But real tunes of good musical taste our popular masters can extract from the leaf of certain trees – blowing at its edge. A ‘pre-musical’ instrument of the aerophonic genre, so to speak, is the ‘bobla’ which is made of the horn of cattle or of the shell of a sea-snail. It is used in the southwestern part of Albania by farmers, shepherds, guardians of vineyards, millers, fishermen and others as a signalling device. Whereas the Albanian settlers in Calabria (Italy) use the ‘vronja’, made of a dried pumpkin, as a means of sounding an alarm. This category includes also the ‘kapza’ or ‘buria’ which children make in spring from the bark of trees in long strips which they wind into the shape of a funnel. 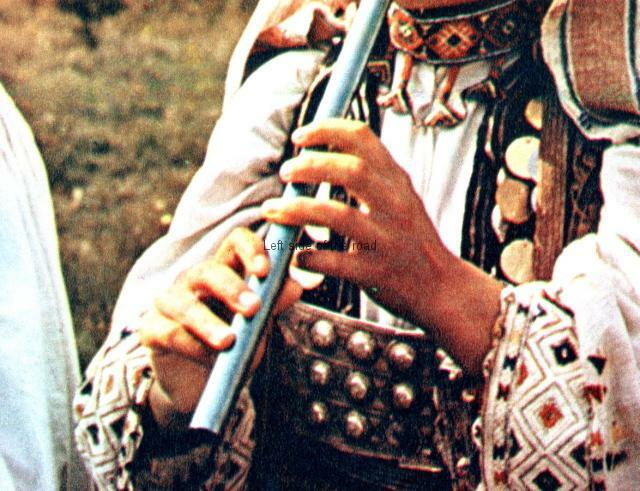 The most popular and the dearest aerophonic instrument of our peasants is the ‘fyelli’ (the flute) which is made in shapes, sizes and names different for each district. The key of this instrument depends on the number of holes and is blown either inclined at the lips or fixed on the tooth. In various shapes, sizes and names appear also the ‘pipza’ which are usually made at harvest time from various stalks. ‘Surleja’ or ‘zunaia’ is another aerophonic instrument with a wooden cylindro-conical neck, some holes on the surface and a double tip at the end. In Laberia we have the ‘bicule’ or ‘cylediare’ made of two tapered nozzles carved on a wooden block, one of the nozzles has only three holes while the other has four on the top and one hole on the opposite side. 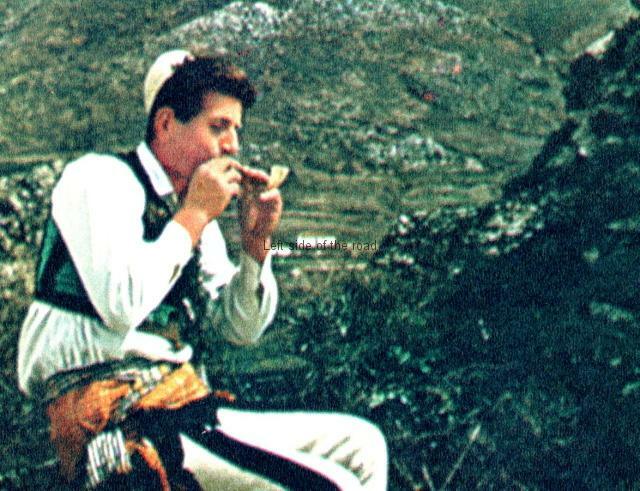 In southeastern Albania we have the ‘gajda’ which is made of a sheepskin with two vents (‘pipka’ and ‘buçalla’) one (the shorter) for the melody and the other (the longer) for the refrain. The genre of string instruments begins also with some children’s musical entertainments as, for instance, ‘lodergramthi’, ‘tingerringe’ ‘ugari’ and others. The most widespread string instruments are the ‘çiftelia’, a stringed ‘bakllamaja’ (3 strings), ‘sharkija’ (4, 6, 8, strings) ‘sazeja’ (10 strings) ‘çyri’ and ‘jongari’ which have been almost abandoned now. This category of instruments possess some common characteristics in shapes, use, etc. but at the same time they are distinct from one another. In addition to the above from this genre we have the ‘udi’ with four pairs of strings and in the shape of a pear cut lengthwise. 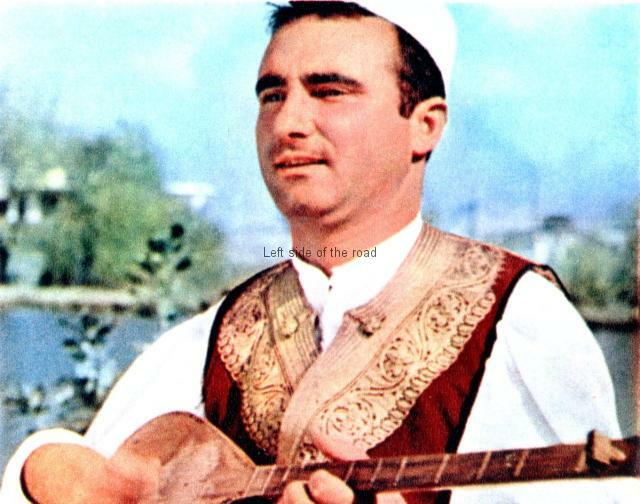 Related to this instrument are the ‘bozuku’ (with from 6 to 8 strings) and ‘kalushun’ (with from 2 to 3 strings) which the Albanian settlers in Italy use. 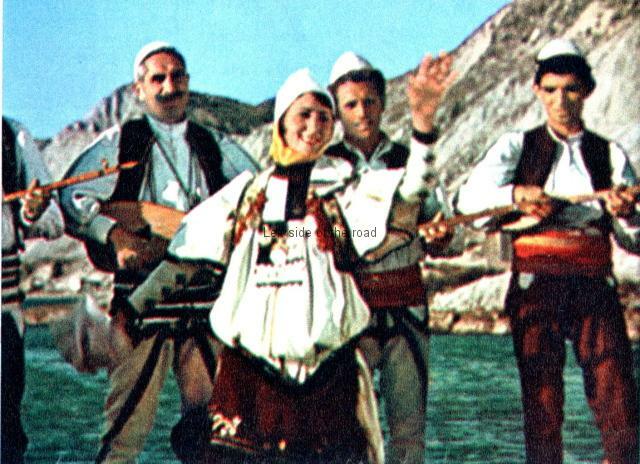 Finally, from this genre we have the ‘lahute’ (with one string) used in Northern Albania and ‘laurina’ (with 3 strings) used in the Mati District. 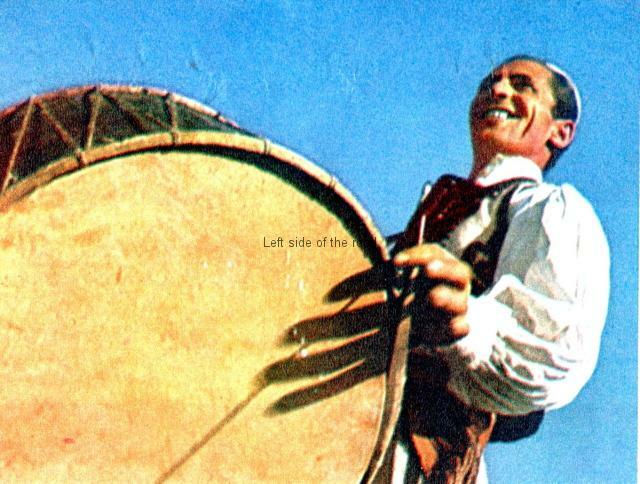 In addition to these musical instruments made by our peasants, our folklore has been enriched by certain instruments manufactured abroad like the violin, clarinet, accordion which are being broadly used by our instrumentalists. In short, these are the musical instruments used by our people. Some of them are used only in certain districts while others are in use all over the country. 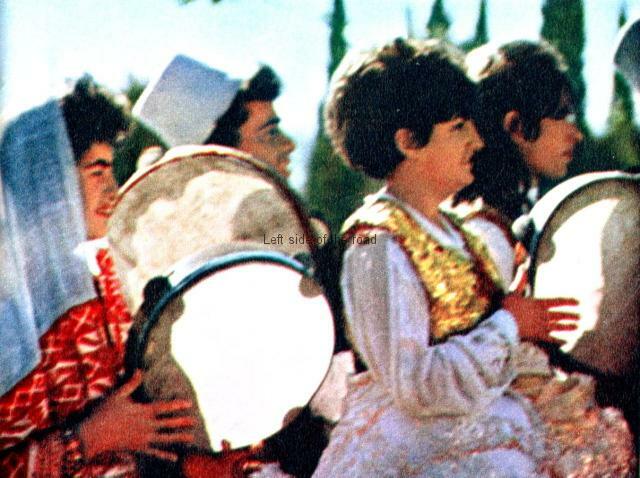 Some of them are native and of old origin while others have been introduced under various historical circumstances but as years roll on have been adapted to the taste and musical peculiarity of our people. Of the above instruments some are used solo while others are used in groups. The way they are grouped depends more or less on the occasion, districts and availability for their use. As a rule, our people prefer groups of few instruments. Many melodies have been created, preserved and developed by these instruments. 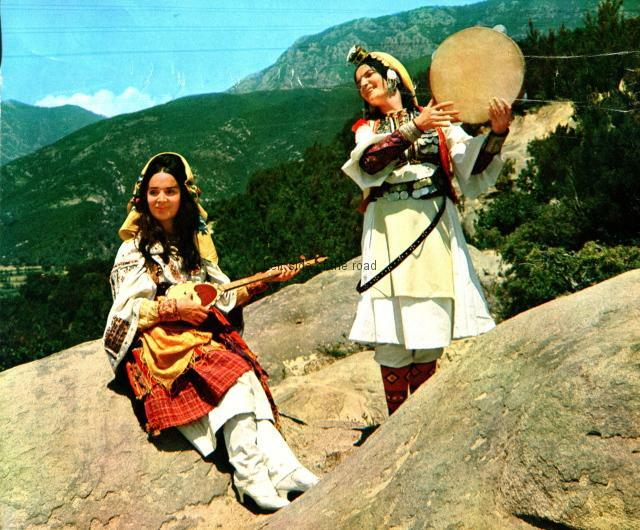 This entry was posted in Albania, Travel and tagged albania, culture, folklore, traditional instruments by Michael. Bookmark the permalink.